The CBI has called on the government to spend an extra £1bn on transport over the next two years, claiming delays are hitting output and stressing-out staff. The business leaders' group wants the cash spent on road and rail projects, and demanded a £60bn injection to take spending in the next decade to £300bn. Director general Sir Digby Jones has also called for the UK's "decrepit" transport planning to be reformed. The government has commissioned a review of long-term transport needs. The review is being conducted by Sir Rod Eddington, former boss of British Airways, and is due to report next spring. A CBI survey of 1,000 firms and individual workers revealed "widespread dissatisfaction" with the UK's transport infrastructure. The study revealed companies believed transport delays led to lost productivity, increased costs and diminished customer service. 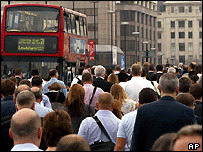 Staff were often late for work and arrived stressed because of delays, the report also said. The findings were released as the CBI's annual conference got under way in London. Sir Digby said: "Although transport spending has risen in recent years, there are decades of under-investment to deal with and it is clear that business still finds it far too difficult to get its goods to market and its people to work. "The government must not bury its head in the sand. We have to do something about it, and quickly." He said half of those questioned believed the UK's reputation as a place to do business was being harmed by transport hold-ups. And two-third of firms believed the problem would get worse before 2010. "Germany built two high-speed railway lines and three airport terminals in the time it took us to have a planning inquiry to build Terminal 5 at Heathrow," Sir Digby told the BBC. "This is no way for the fourth biggest economy on earth to operate." Speaking at the CBI's conference, Transport Secretary Alistair Darling announced that £7m was being given to fund road pricing pilot schemes in seven local authorities including Greater Manchester, the West Midlands and Tyne and Wear. "One of the biggest threats to economic expansion we face in the next 10 years is congestion on the roads in our towns and cities," he said. "Congestion is bad for business, frustrates motorists and hurts local economies."